"Villa Sorriso," or "villa of smiles." Inset: File image of Williams. 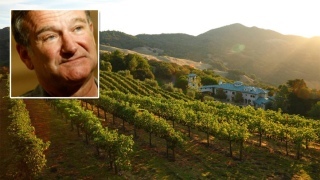 Robin Williams' former Napa Valley estate is back on the market. The 640-acre "Villa of Smiles" is for sale for $25.9 million, 13 percent cheaper than when it hit the market prior to the actor and comedian's death, according to the Los Angeles Times. The villa is 20,000 square feet and sports five bedrooms, 10 bathrooms, a library, a bell tower, a theater and "safe rooms," according to the newspaper. There's also a 65-foot-long swimming pool, a ranch and "more than 18 acres of vineyards," the newspaper reported. No word on what grapes are planted. The villa was built specifically for Williams, who died at his Tiburon home in August.